The Dugway Station Pony Express marker stands alone in the empty Dugway Valley. 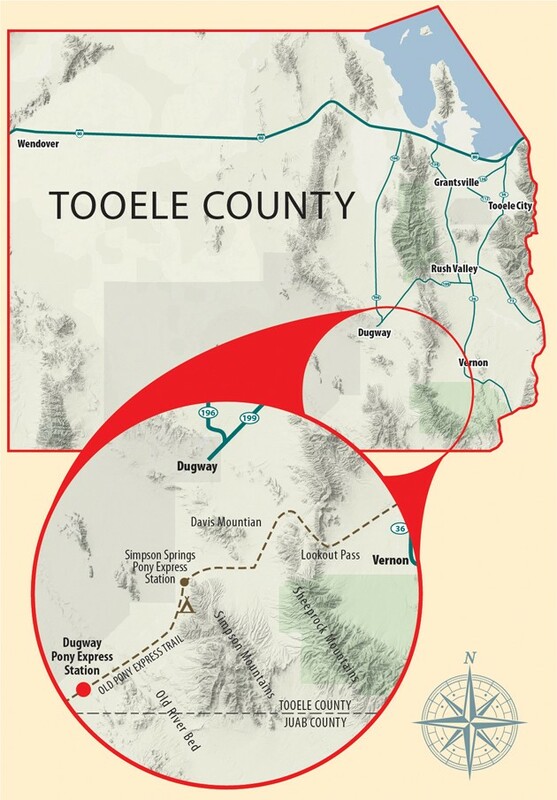 Editor’s note: This is another installment in a multi-part series on exploring the Pony Express Trail through Tooele County. Last week’s article entailed the Old River Bed station. To some people, the Pony Express Trail in western Tooele County is just a gravel road in the desert, which if crossed today, should be done as quickly as possible. 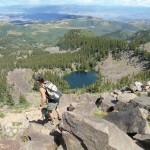 There are, however, dozens of stories of adventure that have faded from memory. But if an interested party searches them out, a treasure trove of interesting material can be found. Emerging from the Old River Bed, as you continue west on the Pony Express Trail, you will enter a flat plain known as Dugway Valley. 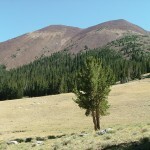 This wide-open area is bordered by the rugged and mysterious country of Keg Mountain to the south, which is a mountain that deserves the attention of the explorer in its own right. The Thomas and Dugway ranges make up the valley border to the west and the vast expanse of the Great Salt Lake Desert opens to the north. The modern road runs straight as a board west towards the mountains, but the actual Pony Express Trail was about a mile to the south and almost parallel to today’s road. Egan left Simpson Springs at about 6 a.m. one day during the time of the Pony Express with a few mules pulling a mud wagon. About 10 miles west of the station, which would have put him just west of the Old River Bed, out in the flat he noticed marks in the dirt where it looked like someone had been setting down a flat bottom basket in the dust every foot or so. Egan looked down the road into the distance and noticed something bobbing up and down, so he sped up his team and soon came alongside No Legs. This poor man told Egan that he had his legs frozen in a blizzard, and to save his life, a doctor cut them off. This causes me to think about the tremendous suffering the indigenous peoples must have faced living in the West Desert, simply on account of the changing seasons. According to Egan, No Legs’s band of Indians would give him food if he was at camp, but they would not wait for him or help him around. He had to travel across the desert from place-to-place the best he could on his own. Egan asked him where he was going and No Legs pointed to an area northwest that was about 15 miles away. Egan asked how long it would take him to get there and he replied one full day and a half a day. Egan offered the man a ride, and before he could get down and help No Legs into the wagon, he had grabbed onto the wheel and heaved himself up into the buckboard seat. What a tough old man to crisscross the West Desert, one foot at a time, back in the 1860s. Approximately 10.5 miles west of the Old River Bed Pony Express Station site, is one of the most forlorn places in the West Desert. It was known back in 1860 as Dugway Station. I don’t believe you could have picked a worse spot for a Pony Express station, because there is no water, it’s in the middle of the open, and the dirt, when dry becomes a silty powder. I believe the station was located here by Egan simply as a matter of geography, because it would have been too long a haul for horse and man to continue on to Fish Springs without a rest. 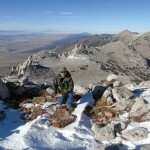 Dugway Pass, just to the west, also had to be conquered by a steep grade, so a rest was in order before that challenge. Where does the name Dugway come from? Back in the days of pioneer wagon travel, in many places the term “road” was a loose one. In several areas where time and means didn’t allow for the construction of roads over a mountain, a “Dugway” would be carved out of the side of the mountain. This dugway consisted of a shallow trench dug on the uphill side of the wagon track in which the uphill wagon wheels would be placed and anchored in order to prevent the contraption from tumbling to the bottom of the draw. The route through Dugway Pass was improved for the Pony Express and Overland Stage, but it was still primitive back in those days. Water for Dugway Station had to be transported in barrels from Simpson Springs. Three wells were dug by workers at the station, but none found water. Unlike some of the other station sites in the West Desert where the record is blank, several notable personnel described Dugway Station and mostly the efforts to dig a well there back in the time of the Pony Express. This alkali dust is no fun to drive through on a hot summer day as it sometimes lies inches deep on the surface and seemingly explodes when you drive over it into tall plumes of dust suspended in the air. It would have been similarly uncomfortable to the express rider to gallop through this stuff and the disturbed dust would have been an advertisement alerting Indians of riders’ presence for miles around. To find the CCC station marker, as you approach the Dugway Range from the Old River Bed, watch for an old 20-foot tank and watering trough on the south side of the road. This is the old Topaz Well. 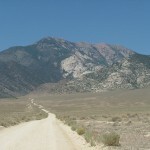 A road leaves the Pony Express Trail and heads south from here to Topaz Mountain, and eventually, Delta. Turn left at the tank and follow the road south for approximately 1.6 miles to where an old two-track dirt road heads west. Take this road and follow it for .8 of a mile as it rambles across two minor drainages. 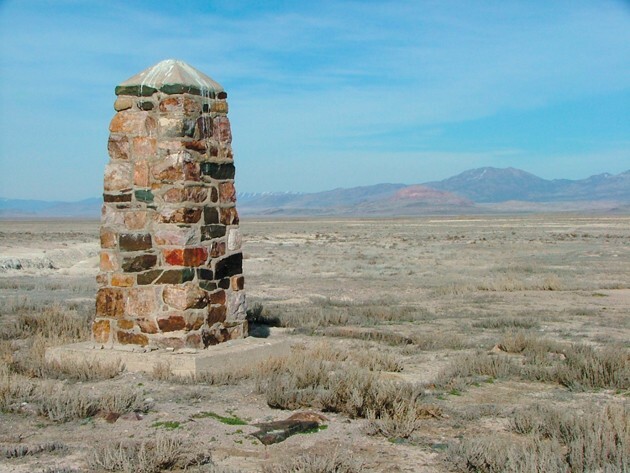 You will end up at the bleak, lonesome obelisk marking the site of Dugway Station. In next week’s article, we will explore the hills and mountains adjacent to this place and discuss the “Dugway” through the mountains.